If you need Running Gear Service – Visit High Seas Yacht Service. It is not uncommon to find Vosper stabilizers in many older yachts and ships. What is uncommon these days is to find a company that specializes in the repair, service and maintenance of the older units. VT Motion, the company that supplied Vosper stabilizers, was acquired by Naiad in 2009 and absorbed into its Naiad Maritime Group. Increasingly, we hear from many ship’s captains and owners that when they seek to maintain their Vosper stabilizers, they are often urged or even forced to upgrade and replace these stabilizers with newer models. It seems that the major stabilizer companies are shying away from Vosper in lieu of recommending a major upgrade – an upgrade that can be expensive and time consuming. At High Seas Hydraulics, we specialize in the repair, service and maintenance of all types of stabilizer systems including Vosper, Naiad, Quantum and others. 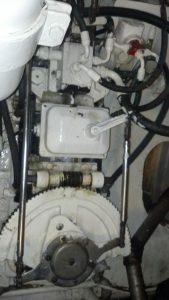 If you are looking for expert hydraulic technicians to work on your stabilizer systems, whether older models like Vosper or newer ones on the market today, look no further than High Seas Hydraulics. All in a day’s work for High Seas Hydraulics. Click to watch the video of a day at High Seas Hydraulics. At High Seas Hydraulics, our work is guaranteed and we deliver on time. To schedule an inspection while in the Fort Lauderdale area or compare notes on a technical question, call or email. © 2017 High Seas Hydraulics. All Rights Reserved.